Stefanie Gordon’s iPhone photos will be a case study that I’ll be discussing with my students in Writing for Mass Communication. One of the photos taken by Stefanie Gordon that went viral. 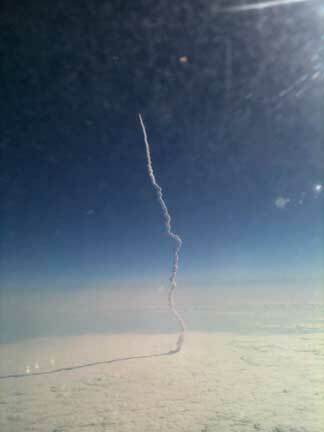 This photo is one of the ones that Gordon took while aboard Delta flight 2285, flying to Florida. As you may know, Gordon was napping but woke up to take these photos after the pilot announced that they had a view of the Space Shuttle Endeavour taking off. She took the photos with her iPhone. She noted in her blog post was her phone was in airplane mode when she took the photos. Her blog post recounts what happened next — her photos going viral and the resulting publicity she has received, including more than a dozen interviews with news organizations, such as the Associated Press, St. Petersburg Times and MSNBC. The reason I’ll be telling her story is that she is using the technology and doing the kind of “communication thinking” that those of us teaching in colleges of communications are helping our students develop. Ability to recognize a newsworthy event. Ability to use mobile technology (i.e. cell phones) to obtain and transmit information. Ability to use social media to present a message. Ability to cultivate a social network that can help distribute the message. Her post ends with her including the tweet she sent, prompted by a friend who knew Gordon was looking for a job. Gordon said she hadn’t received an offer yet, but I imagine an employment opportunity will develop. Businesses from restaurants to department stores to news organizations are trying to figure out how to tap into the potential of social media in its current forms (i.e., Twitter, blogging, Facebook, Foursquare) and be agile enough to identify and move to the next social media platforms. Gordon looks like someone who could do that. And I want my students (and me) to have that ability, too. For those of you who are teaching, what are you doing to incorporate teaching of any of those five skills into your curriculum?